Magnetic Island Australia is in north Queensland. 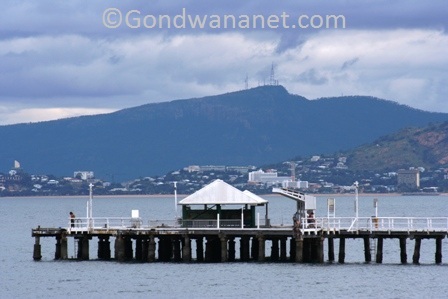 Magnetic Island is an old travel destination just outside Townsville in north Queensland. It is so close to the coast that it's an official suburb of Townsville and many people who live here shuttle daily between the two. It is a large continental island (i.e. not coral cay), and the most popular place on the island is Horseshoe Bay. But there are other places like Balding Bay, Radical Bay, Alma Bay, Arthur Bay and Geoffrey Bay. In the southern end of the Island is Picnic Bay, the oldest township on the island. 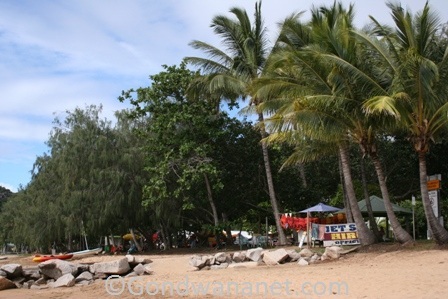 The southernmost settlement on the Magnetic Island is Picnic Bay. Closest to the mainland, it was here as the first tourists started to arrive. 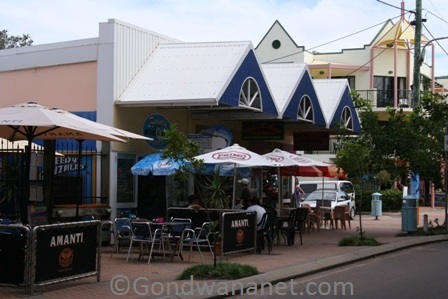 It is also the oldest permanent settlement on the island and today it is a somewhat old-fashioned township with a mall with some shops and restaurants, a quiet beach, an old jetty nice to fish from, and beach barbeques for everyone to use. Picnic Bay. Poster by AllPosters. Click on thumbnail to buy. There is a short walk from Picnic Bay down to Rocky Bay; and an 8km-long walk along the south-eastern coast of the island to West Point. There are not many coastal views along that track as the coast is covered in mangroves, but once in the West Point, there are lovely views over the water, and not many people come here so you can have the beach all for yourself. West Point. Poster by AllPosters. Click on thumbnail to buy. North of Picnic Bay is the township of Nelly Bay, still smaller than Picnic Bay but with all the development happening, Nelly Bay will soon be the largest settlement on the island. The ferries from Townsville used to arrive in Picnic Bay, now they come to Nelly Bay. North of Nelly Bay is Arcadia, with some lovely beaches in Geoffrey Bay and Alma Bay, some shops and backpacker hostels near the beach, and the start to a bushwalk to Horseshoe Bay Lookout. Radical Bay. Poster by AllPosters. Click on thumbnail to buy. North of Arcadia is Horseshoe Bay – the most popular township on the Magnetic island and the centre of tourist activities. Horseshoe Bay beach is the longest beach on the island, and the township’s main street, full of shops, pubs, hotels and restaurants, runs parallel to the beach. The beach park between the main street and the beach is always full of sunbathers, people having picnics, and it used to be a popular place for Christmas picnics and New Years parties but drinking is banned in the park now so things have got quieter. You can have a drink in the outdoor bars and restaurants across the street. Wild koala. Poster by AllPosters. Click on thumbnail to buy. A wide variety of water sports are offered on the Horseshoe Bay beach. You can go on diving courses with Ocean Dive Australia, Pleasure Divers and sea kayaking or Magnetic Island Dive Centre. Jet skiing is offered by Adrenalin Jet Ski Tours, sailing by Jazza Sailing Tours by Magnetic Island Sea Kayaks. Rock wallaby. Poster by AllPosters. Click on thumbnail to buy. You can also hire other gear such as canoes, aquabikes, catamarans and jet skis, and go water-skiing, weigh boarding and tube riding. In the early mornings or late afternoons (when it’s not too hot), it’s nice to go horse riding along the Horseshoe Bay beach. Horseshoe Bay Ranch takes you for a two-hours ride through the bush to the beach. Swimming is always excellent but beware the marine stingers between October and April – always swim between the flags and during the stinger season only inside the stinger enclosures, although it’s safest to wear a stinger suit. East of Horseshoe Bay are the lovely small bays Balding Bay, Radical Bay, Cowrie Bay, Florence Bay and Arthur Bay. You can reach them all by short but steep bushwalks with some great views over the blue ocean. Up here are also the interesting old Forts from the WWII when Magnetic Island was used as a military outpost. Watch up the trees on the tracks around the Forts – there is a population of wild koalas living here and you are guaranteed to see them – I have done the walks many times and there was not a time when I didn’t see them sleeping in trees. Arthur Bay. Poster by AllPosters. Click on thumbnail to buy. Magnetic Island Magnetic Island is too large and hilly to walk around, so you will need some sort of transport. You can bring your car along from the mainland with the Fantasea Car Ferry, but it’s fairly expensive compared to the regular ferry ticket. Bus Service is cheap and fairly handy – it shuttles between all the townships and meets all the arriving ferries in Nelly Bay. 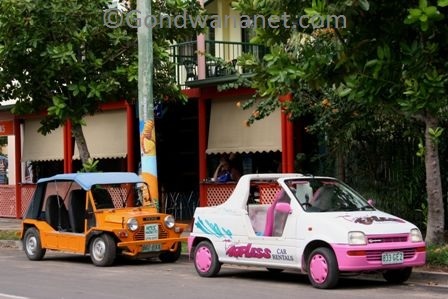 Various places on the island rent out bicycles but the most popular way of getting around is to rent a moke from the MI Wheels or Moke Magnetic. 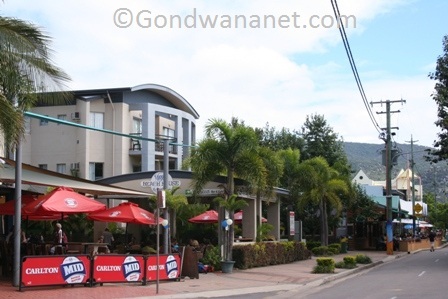 There is a wide variety of accommodation on Magnetic Island ranging from backpackers hostels to fancy resorts, and none of it is overly expensive. The two best places to stay in Horseshoe Bay are Bungalow Bay and Maggies Beach House. In Arcadia, the budget places are Arkies, Centaur House and Foresthaven; and would you like to pay a bit more there are Dandaloo Gardens, Marshall’s B&B and Beaches B&B. In Nelly Bay, there are Base Backpackers, Coconuts on the Beach, Magnetic Island Tropical Resort, and the mid-range Island Palms Resort, Island Leisure Resort, Palm View Chalets and Mandalay B&B. In Picnic Bay there are the Travellers Resort (a noisy and run-down backpackers place that was not to recommend when I last stayed in 2003 but things may have changed), and the more expensive Tropical Palms Inn and Dunoon Resort. Camping is not allowed in the national parks but you can set up your tent at two backpackers places: Bungalow Bay in Horseshoe Bay and Coconuts on the Beach in Nelly Bay. 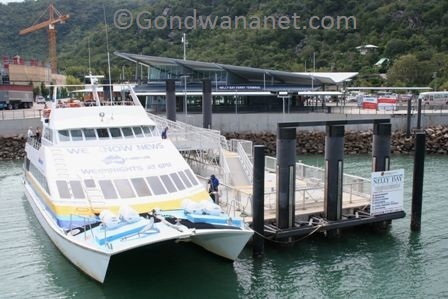 To get to Magnetic Island from Townsville, you have two options: either you catch the Fantasea Car Ferry from the southern side of Ross Creek in Townsville, or you catch Sunferries from Flinders Street West (which is handiest) or Breakwater Terminal (which has a larger car park). Sunferries also make trips to Great Barrier Reef from Townsville. Here's a Magnetic Island map, where I have tagged the places that I mentioned on this web page. You can click on the tags to see what places they are, and double-click anywhere on the map to zoom it in and see the places closer. Drag the map to move around, and if you want to see the satellite image with Google Earth, click on "Sat" in the top right hand corner.